Leading Wholesale Trader of corona camera - uvsee td90, corona camera - uvsee td100, economical daylight corona imaging camera 6d, solar blind corona camera for arcing corocam7 and combined infrared and corona imaging camera - corocam 8 from New Delhi. 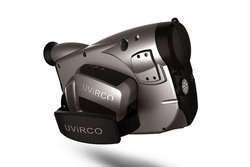 UV Corona Camera is an innovative NDT (Non Destructive Testing) equipment, that detects, pinpoints and documents flash-arc corona and arcing partial discharge camera. Being with high sensitivity Corona Camera is a power tool to detect UV emission in full daylight with high signals from faraway and nearby sources. Corona Camera is an ideal predictive maintenance device for overhead transmission lines and high voltage substations. TD100 is the latest Solar-blind UV Corona Camera which enables optical detection of UV signal in full daylight. With the high sensitivity to UV in the solar blind range, it is a powerful tool for detecting weak UV signals from long distance. 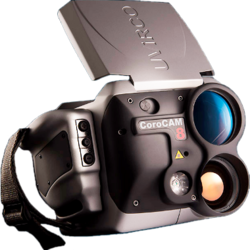 The CoroCAM 6D® is a re-development of the CoroCAM Solar Blind UVc® imaging System with an emphasis on cost reduction through innovative design. Sensitivity was improved through the use of newly designed solar blind filter packs and a specially developed low noise, high sensitivity detector. Modernized electronics were added to reduce weight, system noise and size. The CoroCAM 6D® can be factory fitted with an optional motorized module which allows the camera to operate in Solar Blind (SB) or Non-Solar Blind (NSB) modes. NSB mode removes the SB filter from the light path and allows more UV light to reach the detector - this boosts the cameras sensitivity. In NSB mode the CoroCAM 6D® can only be used at night or indoors. The CoroCAM 7® is a professional grade solar blind, easy to operate UVc imaging system used to visualize & locate electrical discharges (corona and arcing) from HV hardware. 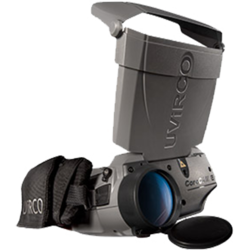 The CoroCAM 7® features the same CoroCAM® solar blind UVc imaging system as used in the CoroCAM 6d®, but pairs it with a high performance visible camera and a viewfinder. The CoroCAM 7® is typically used to inspect HV infrastructure operating at 3.3 Kv and above for corona discharges and arcing. 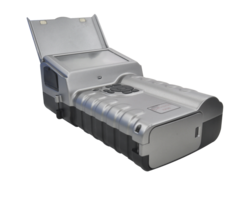 The CoroCAM 8® is a combined thermal IR, solar blind corona and video camera. 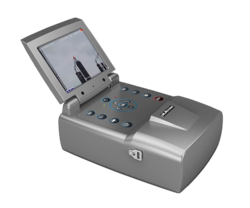 It features a high spec Sony visible camera, a radiometric FLIR thermal IR camera and a solar blind UV camera. The CoroCAM 8® is intended for use by professional HV inspectors. The combination of these 3 cameras makes it possible to do both thermal IR and UV inspections at the same time, saving time and effort. Co-location of electrical discharges and hot spots give the inspector more insight into the cause of a fault. The CoroCAM 8® can be used to inspect HV infrastructure operating at 3.3kV and above. Looking for Corona Cameras ?